Headache? Stiff joints? Sore back? Most of us pop an over-the-counter pain medication like aspirin or ibuprofen without thinking too much of it. Sometimes, though, one isn’t enough, and then what do we do? Take another? And another? When should we stop? It’s gotten a little confusing lately. Used to be we would just read the label and be sure not to take too many pills. But lately, aspirin and ibuprofen and other non-steroidal anti-inflammatory drugs (NSAIDs) are showing up just about everywhere. Check your cold and flu medications, for example, or your headache pill. 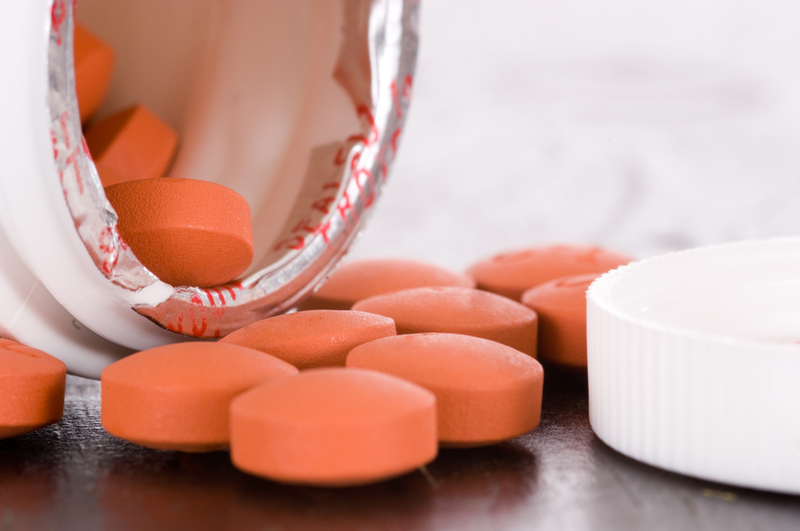 Even your allergy medications may have NSAIDs in them. That can make keeping track of just how much we’ve taken a little more difficult. Then there are the recent studies sounding alarms we’ve never heard before. Like the one that suggested elderly people with chronic pain would be better off taking opiates like codeine and morphine than a steady diet of NSAIDs. Or the one that found that people taking drugs to prevent blood clots after a heart attack could risk a second heart attack by adding NSAID pain relievers to the mix. Just how dangerous are these drugs, and what do women need to know about taking them? COX-1: Active mostly in the gastrointestinal tract. Produces “prostaglandins” (hormone-like substances) that lead to inflammation and pain. These prostaglandins also protect the stomach and intestinal lining, and activate platelets to help clot blood. COX-2: Found mostly in the lining of blood vessels. Produces prostaglandins that lead to inflammation and pain. Also works to prevent blood clots. There are some risks, though. By stopping the COX-1 enzyme from producing stomach-protecting prostaglandins, NSAIDs can lead to stomach problems, like bleeding and ulcers. Blocking either enzyme can also reduce the blood’s ability to clot, which can lead to excess bleeding. According to the Food and Drug Administration (FDA), NSAIDs are associated with certain health risks. These are higher in those who use the medications for a long time, have heart disease, are elderly, and frequently smoke and drink. We used to believe it was mainly the newer drugs targeting only the COX-2 enzyme that were most dangerous to the heart. These drugs came to light a little over a decade ago, and were believed to be safer than traditional NSAIDs because they didn’t affect COX-1. That meant they were less likely to cause stomach bleeding. But later studies linked these newer drugs to a significant increase in heart attack and stroke. That’s why Vioxx and Bextra, which inhibited COX-2, were pulled from the market over a decade ago. Celebrex is still available, though it remains linked to heart attack risk. More recent studies suggest traditional NSAIDs, as well, may be linked to an increased risk of heart attack and stroke. In 2009, for example, the American Geriatrics Society (AGS) stopped recommending NSAIDs for adults aged 75 and older with chronic pain, suggesting opiates like codeine instead. The AGS found that these drugs, when taken in moderate to high doses over time, could increase risk for heart attacks, strokes, life-threatening stomach ulcers, gastrointestinal bleeding, impaired kidney function, worsened blood pressure levels, and other effects. They recommended these drugs be used in the elderly only with extreme caution. In July 2015, the Food and Drug Administration (FDA) announced they were strengthening warnings on the labels of NSAIDs to indicate they could increase the risk of heart attack and stroke. After reviewing a variety of new safety information and studies, they determined the drugs could increase the risk in patients with or without heart disease or risk factors for the disease. The risk was higher at higher doses and increased with longer use. Taking NSAIDs along with anticoagulant drugs (blood-thinning medications) has also been found to significantly increase risk of excessive bleeding leading to a stroke or heart attack. According to a 2015 study of over 61,000 participants, people who took NSAIDs while taking other anticoagulant drugs were about twice as likely to suffer a bleeding event than those not taking NSAIDs. Even taking an NSAID for less than a week was associated with an increased risk of bleeding and/or a second heart attack. Reading all this, you may start to wonder: Why do doctors recommend a low-dose aspirin, then, to prevent a heart attack? Aspirin also works by inhibiting COX enzymes, and has been shown in studies to help lower the risk of heart attack and stroke when taken at low doses. It works to inhibit blood clots, and thus can keep blood flowing smoothly. It helps to take lower doses of the medication, as that reduces the risk of side effects. Long-term use of higher doses is still linked with risks like stomach bleeding, kidney failure, and strokes. The FDA warns that if you take a low-dose aspirin, you should be aware that adding over-the-counter ibuprofen or naproxen to the mix could interfere with its protective effects. Deciding whether the benefits of a low-dose daily aspirin outweigh the risks is up to you and your doctor. 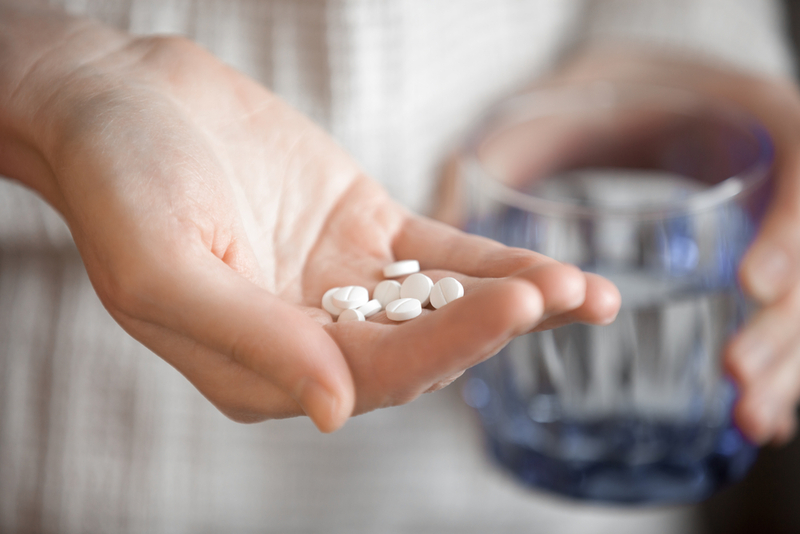 There are some other risks associated with NSAIDs that are specific to women’s health. Though scientists already knew that these drugs could increase risk of heart attack and stroke, they found in 2014 that they could increase risk of heart attack in women, specifically. Researchers reviewed data from more than 160,000 postmenopausal women, and found a moderately increased risk of stroke and heart attack linked with both COX-2 inhibitors and those that affect COX-2 more than COX-1 (like naproxen). Those that inhibit COX-1 more than COX-2 (like ibuprofen) were not found to increase risk. Inhibit ovulation: A recent 2015 study found that diclofenac, naproxen, and etoricoxib inhibited ovulation in women who were taking the medications to ease mild musculoskeletal pain. More specifically, only 6.3 percent on diclofenac (100 mg twice a day), 25 percent on naproxen (500 mg twice a day), and 27.3 percent on etoricoxib (90 mg once daily) ovulated, compared to 100 percent of the control group. Researchers concluded that even short-term use of these drugs could affect a woman’s ability to have children. Impact fetus: A 2012 study indicated that NSAIDs given to pregnant women do cross the placenta, and may adversely affect the fetus, depending on the dose and duration of therapy. Specifically, the drugs were linked with increased risk of miscarriage and malformations when taken in early pregnancy, and increased risk of other defects of the brain, kidney, lungs, heart, and stomach when taken later in pregnancy. A later 2014 study, however, found no increased risk of miscarriages when NSAIDs are taken during pregnancy. Affect delivery: Scientists recommend that women avoid NSAIDs in the last six to eight weeks of pregnancy to avoid prolonged gestation or other potential complications, like excessive bleeding. Heart attack: A recent study found that women taking low-dose aspirin did not experience the same heart-attack-lowering benefits as men, though they did have fewer strokes than men. We need more research on this, but it suggests these drugs may act differently in women than in men. On the other hand, some studies have indicated that NSAIDs may have a slightly protective effect on bone health in older women, inhibiting bone loss and preserving bone mineral density. Another study also indicated that regular use of low-dose aspirin significantly reduces the risk of colorectal cancer in women. Recommended Dosage: How Much is Too Much? What women need to remember with NSAIDs is not to take too much for too long. How do you know how much is too much? Your best bet is to read the label and follow directions, and be sure to check for NSAIDs in all the drugs your taking, including cold and flu, headache, and allergy medications. If you take an allergy pill and an ibuprofen at the same time, for example, you could be getting a lot more pain reliever than you thought. Next, consider your own risk factors. If you’re over the age of 65, you have heart disease or risk factors for it, you’re taking blood-thinning medications, you have kidney problems, or you’re pregnant, talk to your doctor about your risks. In the end, it’s important to be aware of the risks, but that shouldn’t stop women from using NSAIDs when they need them. Pain, particularly chronic pain, presents its own health risks. In addition, the risks associated with NSAIDs are low overall. Choose the lowest dose you can and use it for as short a period as possible. If you have risk factors like heart disease or gastrointestinal problems, ask your doctor for his or her recommendations. If you’re taking the maximum dose on a daily basis for longer than a couple days, check with your doctor for other, potentially safer options. Consider taking acetaminophen first for pain, as it doesn’t increase risk of heart problems or bleeding, but be careful to follow dosing recommendations. Too much of this medication can lead to liver damage. Be aware of maximum daily doses and do not exceed them; it’s best to stay well underneath them: ibuprofen (3200 mg), naproxen (1200-1500 mg), aspirin (4000 mg). If you’re regularly using the maximum dose for longer than a few weeks, you’re using too much—check with your doctor. “FDA Drug Safety Communication: FDA strengthens warning that non-aspirin nonsteroidal anti-inflammatory drugs (NSAIDs) can cause heart attacks or strokes,” FDA, July 9, 2015, http://www.fda.gov/Drugs/DrugSafety/ucm451800.htm. 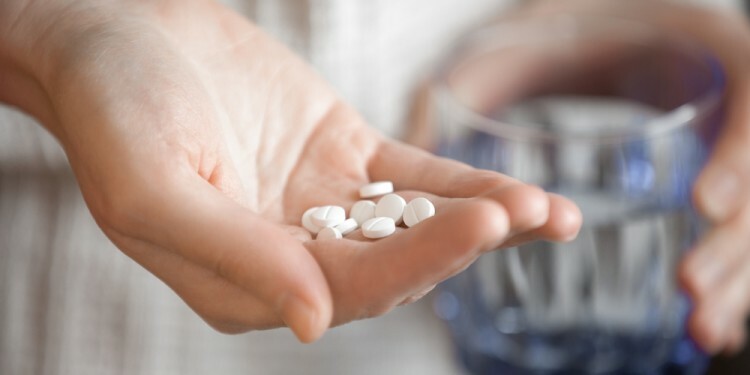 “American Geriatrics Society Recommends Opioids as Second-Line Therapy for Chronic Pain, Instead of NSAIDs,” Topics in Pain Management,” August 2009; 25(1):9-10, http://journals.lww.com/topicsinpainmanagement/Citation/2009/08000/American_Geriatrics_Society_Recommends_Opioids_as.3.aspx. Anne-Marie Schjerning Olsen, et al., “Association of NSAID Use with Risk of Bleeding and Cardiovascular Events in Patients Receiving Antithrombotic Therapy After Myocardial Infarction,” JAMA, 2015; 313(8):805-814, http://jama.jamanetwork.com/article.aspx?articleid=2130316. European League Against Rheumatism, “Non-steroidal anti-inflammatory drugs inhibit ovulation after just 10 days,” ScienceDaily, June 11, 2015, http://www.sciencedaily.com/releases/2015/06/150611082124.htm. Antonucci R, et al., “Use of non-steroidal anti-inflammatory drugs in pregnancy: impact on the fetus and newborn,” Curr Drug Metab., May 1, 2012, 13(4):474-90, http://www.ncbi.nlm.nih.gov/pubmed/22299823. Douglas C. Bauer, et al., “Aspirin and NSAID use in older women: Effect on bone mineral density and fracture risk,” Journal of Bone and Mineral Research, January 1996, 11(1):29-35, http://onlinelibrary.wiley.com/doi/10.1002/jbmr.5650110106/abstract?systemMessage=Wiley+Online+Library+will+have+intermittent+access+on+8th+August+2015+from+10%3A00-16%3A00+BST+%2F+05%3A00-11%3A00+EDT+%2F+17%3A00-23%3A00+SGT+for+essential+maintenance.++Apologies+for+the+inconvenience. Edward Giovannucci, et al., “Aspirin and the Risk of Colorectal Cancer in Women,” NEJM, September 7, 1995; 333(10):609-614, http://www.researchgate.net/profile/Graham_Colditz/publication/15560869_Aspirin_and_the_risk_of_colorectal_cancer_in_women/links/0046352c2c1497dd85000000.pdf. “NSAIDs do not increase risk of miscarriages: Study,” Canadian Medical Association Journal, [Press Release], February 3, 2014, http://www.eurekalert.org/pub_releases/2014-02/cmaj-ndn012814.php. Amanda Risser, et al., “NSAID Prescribing Precautions,” Am Fam Physician, December 15, 2009; 80(12):1371-1378, http://www.aafp.org/afp/2009/1215/p1371.html. “The Non-Steroidal Anti-Inflammatory Drugs: Treating Osteoarthritis and Pain,” Consumer Reports, https://www.consumerreports.org/health/resources/pdf/best-buy-drugs/Nsaids2.pdf. These numbers seem awfully high! In fact, some are higher than traditional birth control. I was prescribed Naproxen by my pain management Dr in Arizona. After prolonged use my kidney has failed. I live in Tn now and the Dr’s here have me on the right diet to not have the kidney go below 34%. So far so good.